for someone who's not even a free agent or on the trading block, Michael Brantley sure did cause quite a stir at this year's annual Winter Meetings in Nashville, Tennessee. why? because there was a lot of conflicting information about his shoulder surgery and subsequent recovery timetable. so i put together all the news i came across each day this week, in chronological order, from all my sources. i also included my own daily thoughts and the reactions i had after reading everything. 'twas the night before Winter Meetings, when all through Tennessee, the rumor mill was churning, with the focus on Michael Brantley. worse than they thought," he stated. "the operation was more complicated and he might not be back until August." fans immediately panicked and soon my #1 stats man, Jordan Bastian, was being bombarded with tweets questioning if this was true. he said he spoke with multiple sources within the organization and they all denied it, affirming that the timetable of 6 months for Michael had not changed. Tony Lastoria, another respected Tribe source of mine, claimed it's standard procedure for the Indians to deny something like that before they themselves release the info. he conjectured it was probable that the Indians were trying to keep that news quiet for the time being and Gammons went public with it without realizing he maybe shouldn't have. Lastoria correspondingly ascertained that Gammons has deep sources. --i don't personally follow Gammons for Tribe information, so at first i completely disregarded this news. but after seeing how much Lastoria--someone i highly trust--believed it, my heart began to sink. i truly hope that Gammons' source is not one of the sources that Bastian spoke with. i would hate for someone to be open with Gammons about Michael, but lie right to Bastian's face. --hearing this, i can't hide my concerns. i feel SOOOOO bad for Michael that he's now potentially going to miss over half the season and might only get to play for 2 months. i can't even fathom that. and of course, in the back of my mind i'm worried that he may not be the same player when he comes back. what if this injury has ruined his career? --this honestly confuses me. when the Indians announced Michael's surgery 4 weeks ago, why didn't they say then that it was a complicated surgery? why did they give us that BS about "6 months recovery" and he'd be back by May? why not just admit right then that he'd be out until August? although, Gammons' wording was "might" be out until August. it's possible Michael still could be back in May i suppose. --and if in fact the surgery was more complicated, then were the Indians given incorrect info about Michael's condition to begin with? was there a misdiagnosis? i watched that labral tear surgery video and it looked pretty simple to me. makes me wonder if they found other issues that needed to be taken care of when they finally went into Michael's shoulder. if that was the case, then again, why didn't they tell us that 4 weeks ago when the surgery was originally announced/performed instead of waiting until today for it to slip out? this all seems shady. but perhaps the Tribe didn't want other teams to know how bad their OF situation was gonna be going into 2016. --lastly, my most obvious question: why not simply go straight to who i consider to be the BEST source of all to get the truth--Michael's agent? the first thing i saw on Monday was Paul Hoynes tweeting that a source close to the situation says Michael might not play until June, but the Indians say that's not true. the Cleveland Indians twitter account gave an update shortly after, maintaining that Michael is on track in his recovery from shoulder surgery and there's no change at this point from his original return estimate. in addition, they declared there was misinformation floating around. Lastoria said he didn't think it was disinformation and that the source is within the Indians. he further explained that the only places Gammons could have gotten that info from was Brantley himself, which is unlikely, someone in the Indians front office, or Brantley's agent--the most likely source. Hoynsie's article on cleveland.com elaborated on his earlier tweet, revealing that he received his information Sunday night, and his source disclosed that Michael won't be able to start baseball activities until May, pushing back his return to game action to June. Indians President of Baseball Operations, Chris Antonetti, disputed this, pronouncing, "that's not our expectation. there has been nothing new since the last update." Buster Olney broke the news that Michael had what the Indians consider to be a routine checkup on Tuesday and that they think he's been on track after having surgery. later on in the day when Antonetti (and GM Mike Chernoff) met with Indians reporters, he repeated that Michael being out as late as August was inaccurate. "Michael is on track for his recovery," Antonetti proclaimed. "there's been nothing out of the ordinary with his rehab so far. the timelines, everything we talked about with you, still remains the same." Hoynsie similarly confirmed Michael had his regular checkup scheduled for Tuesday in Delaware. Bastian provided more quotes from Antonetti about Michael's recovery plan in his nightly article. "we were really upfront with Michael. we know his personality is going to be trying to do more, but he understands the importance of letting the rehab process play out and not trying to expedite it. we'll go as quickly as it makes sense, but not any faster. Michael is on board with that." Bastian additionally wrote that Michael has made positive strides in his rehab program so far. in Hoynsie's night article, Antonetti talked about how Michael would go through his "spring training" when ready. "when Michael gets to a point where he can start building his volume (of work), he'll start where he normally would in the offseason. then he'd have to go through a spring training type of progression. but that was built into the timetable we had earlier." Michael will likely participate in extended spring training with Indians minor league players in Goodyear, Arizona, and then play rehab games with the minor league teams. Antonetti also specified that when Michael is ready to play with the Indians again, he won't need to be eased into games as the DH; he can go right back into left field since he throws left-handed. --to recap: the Indians think he'll be back in April or May, Hoynsie heard June, and Gammons/possibly Michael's agent allege August. that clears things up. --like i said the day before, they all should have asked Michael's agent for the scoop to begin with. now it's being speculated that his agent IS the one who started this. that doesn't sit well with me. --where is June coming from? what "close source" does Hoynsie have? obviously it's different from whoever Gammons got his update from. and once again, they're saying "might" not play. doesn't mean he for sure won't play until June. all these rumors, i can't. --a one month follow-up appointment with Dr. Morgan makes sense. after that, i expect to get a valid update that all my sources agree on. --maybe we should wait until Michael's more than 1 month removed from his operation before we declare return dates and cause hysteria. i think it's gonna come down to how he feels as time goes on, and how much progress he makes when he can resume his baseball activities. after all this chaos and initial alarm, i can now truthfully profess i'm not too concerned about this August talk. Michael will go stir crazy if he's gonna be out that long, and i just don't believe it. Bastian tweeted there was no update from Michael's checkup with Dr. Morgan, and that the Indians weren't expecting to hear anything out of the ordinary. 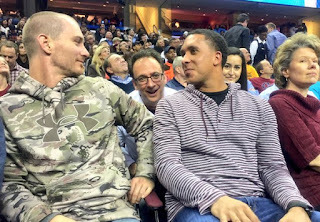 later at night, the Indians tweeted that Michael and Josh Tomlin were both at the Cleveland Cavaliers game. Michael was all smiles and not wearing a sling. --i am very surprised to see Michael sans sling here. wow. how can surgery have been "worse than they thought" if he's merely 4 weeks out and has no sling on, hence free to move his arm and shoulder already? don't try to tell me he's not gonna play ball for 8 months now. Michael basically disproved the "more complicated surgery" rumor tonight. in the afternoon, Zack Meisel tweeted that nothing changed with Michael's recovery. "all signs positive." likewise, Hayden Grove tweeted that Chernoff said Michael's checkup went well and he's on the same course in terms of his rehab. when Hoynsie was a guest on Sports Insider on cleveland.com, he was asked if he had any insight on where the "Brantley won't be ready until August" story came from. Hoynsie laughed the entire time he replied. "i know exactly where it came from because i was talking to the guy that started it on Sunday night and i know this guy. he's trying to half-bluster, half-fact, and he told Gammons that and Gammons went right on the air with it." besides that, Hoynsie divulged that Michael was back in Cleveland Tuesday night (which we knew) getting examined by the Indians medical staff (which we didn't know) after his checkup in Delaware with Dr. Morgan, and they continue to communicate that everything's on schedule. --what did Hoynsie do on Sunday night? talk to the guy who said Michael would be out until August, then talk to another source who said he'd be out until June, THEN talk to "the Indians" (different people from the previous 2 sources apparently) who said he'd be out until April or May? good grief. --OR, could it be that the guy who told Gammons the August thing was the same person who told Hoynsie June? was this source backtracking a little once Hoynsie approached him for info after Gammons went on TV? sounds like we might have a little gossip girl situation on our hands if that's what really occurred. --so that's why Michael was at the Cavs game. it was more so because he was already in town getting checked on by the medical staff. makes total sense to me now. --i guess we, the public, will never know where that "out until August" info originated from. that source doesn't seem very reliable at this point, so for his sake, i guess it's best that he isn't revealed. way to put panic in every Tribe fans' heart this week, whoever you are. i'm no longer buying into the Gammons rumor. i think the August thing is a worst case scenario that was made out to be the present situation for reasons i don't know. it's not as if Michael needed the publicity. i think this whole week was a lot of stress that Indians fans (and reporters) didn't need to deal with, much ado about nothing, and quite frankly, a waste of everyone's time. let's see how he's feeling in a couple months; then we can get a more precise timetable because presently, nothing is guaranteed. 'til then, i'm not letting myself get worked up about it. one thing i can guarantee you however, is that no matter when Michael returns, this blog will go on. keep checking back here for further updates and follow me on twitter @clevelandgirl23 for news and my thoughts as any new details are unveiled. and here's hoping Michael has a happy and HEALTHY New Year!